ENGLISH FOR BEGINNERS PERFECT CHOICE IF YOU? > need a guarantee that your learning will bring results. That is why at Speak Up we offer two options to choose from to start your basic course. Leave us your contact information, and we will help you with your English. Safety - other participants in the classes you attend there will be only students on the same level as you. Support - you have your own personal didactic support, people who will support you and monitor your achievements. 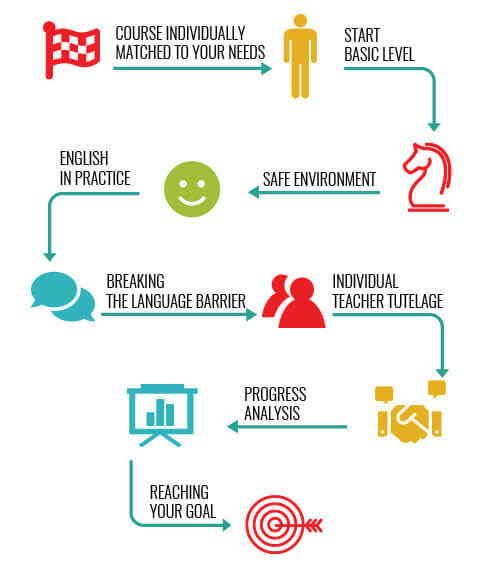 Effective teaching method - we have created our own teaching method that ensures language immersion for our students. This helps you learn much faster than traditional methods. You will speak English during your very first class! Teacher Contact Classes - 60-minute classes which focus on different skills and train you in every aspect of language. You can also use Personal Follow Ups - individual consultations with teachers that take up to 30 minutes. Multimedia Lessons – without limits. Multimedia Lessons are interactive general classes, which develop a variety of skills and aim at systematising and solidifying your knowledge. Multimedia Lessons help our students feel comfortable during classes with a teacher. WE ALL LIKE TO HAVE A CHOICE, THIS IS WHY YOU CAN DECIDE IF YOU COMPLETE THE CLASSES AT A SCHOOL OR ONLINE. You can choose the Virtual Speak up School only or you can choose mixed classes (some completed online in the Virtual Speak Up School and in a brick-and-mortar school). Online Classes with the teacher are recorded so you can replay them any time! You can understand and use basic expressions. You can describe everyday life in simple words. You know how to introduce yourself and others. You can describe the place that you live in, people that you know or things/objects from your surroundings. It is important that your partner speaks English slowly and clearly. They should also be ready to offer you necessary language assistance and help. You can introduce yourself and others. Without problems, you can talk about yourself and give basic information in simple sentences (what is your job, where do you live, what is your daily routine, what do you like). Using basic vocabulary you can describe your day and give simple instructions to your conversation partner. You can talk about your favourite activities and ask questions. You can describe your house, family life and with pleasure tell other people about important events. With ease, you can hold a simple conversation about cooking, do the shopping and invite friends to your birthday party. Thinking about the future in English? Talking about changes in life? Even on the phone? These tasks are tailor-made for you! You can describe your skills and talents. You can talk about your generation or about the past. Small talk about holidays or the weather? – No problem! You can describe the appearance and character traits of your friends. You can express obligation and necessity. You can agree and disagree. With ease, you will describe your place of living and order your favourite meal in a restaurant. Requests? Planning for the future? – You can do it! You can make offers, form assumptions and express requests. You can share your experience and express emotions such as joy, admiration, disbelief and surprise. Really? You can ask for information and give recommendations. You can describe life in a big city and talk about your hobbies in an interesting way. CO MÓWIĄ UCZESTNICY KURSU PODSTAWOWEGO? Finally, classes that do not stress me and, I am able to communicate! It is good to have a conversation with people that are on the same level and have the same needs – then the process of learning is really smooth. Learning at Speak Up is not only about English but also about people with similar passions that you meet here. © 2019 Speak Up. All rights reserved. Copying the content forbidden. SPEAK UP LEARNING Spółka z ograniczoną odpowiedzialnością z siedzibą w Warszawie przy Al. Solidarności 117, 00-140 Warszawa (adres korespondencyjny: Al. Jerozolimskie 123 A, 02-017 Warszawa), wpisana do rejestru przedsiębiorców prowadzonego przez Sąd Rejonowy dla m.st. Warszawy, XII Wydział Gospodarczy Krajowego Rejestru Sądowego, pod numerem KRS 673344, NIP 5252709433, kapitał zakładowy w wysokości 10 200 000 złotych.